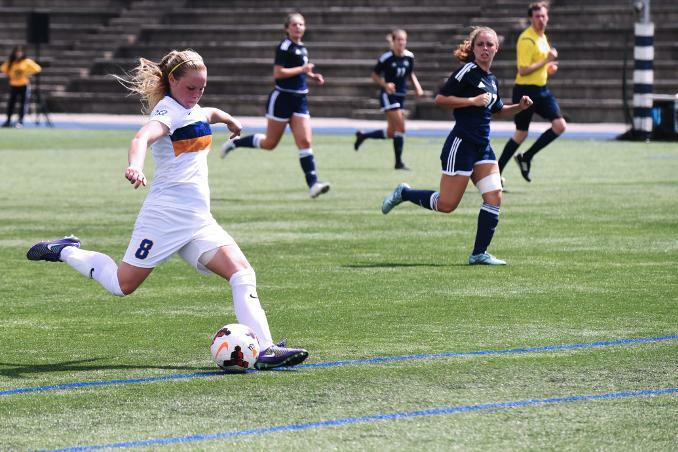 The Ryerson Rams women’s soccer team broke their scoring drought to secure their first win of the season with a 2-1 victory against the visiting Nipissing Lakers at Monarch Park on Sunday afternoon. The Rams, who had gone scoreless in all of their pre-season games and first regular season game, made some major adjustments to their lineup to start off the match. Brittney Clendenan, who usually plays keeper for the Rams, found herself playing forward to start the day. In the 35th minute, that switch in position proved to be just what the Rams needed as Clendenan scored Ryerson’s first goal of the 2016 campaign. Following the Clendenan goal, the Rams were able to create scoring opportunities and were finally able to extend their lead to 2-0 shortly before the end of the first half on a goal by Sierra Clancy. The second half saw a more aggressive and urgent Nipissing squad come out and attack the Rams defence. The Lakers were finally able to capitalize on their efforts when Selena Innamorati scored on a penalty kick, closing the gap between the two teams. After scoring their first goal, Nipissing continued to apply heavy pressure, testing the Rams defence. But the Rams were able to stay strong and held on to win the game, as keeper Elisa Lapadula made nine saves to claim her first win as a Ram. With the win, the Rams improve their season record to 1-1-0, and look to carry their momentum into their next game on September 3 against UOIT at Monarch Park.